I rolled my eyes. We were headed for an ice-filled Disneyland. I just knew it. Worse, I wasn’t going to be able to talk my wife out of it. 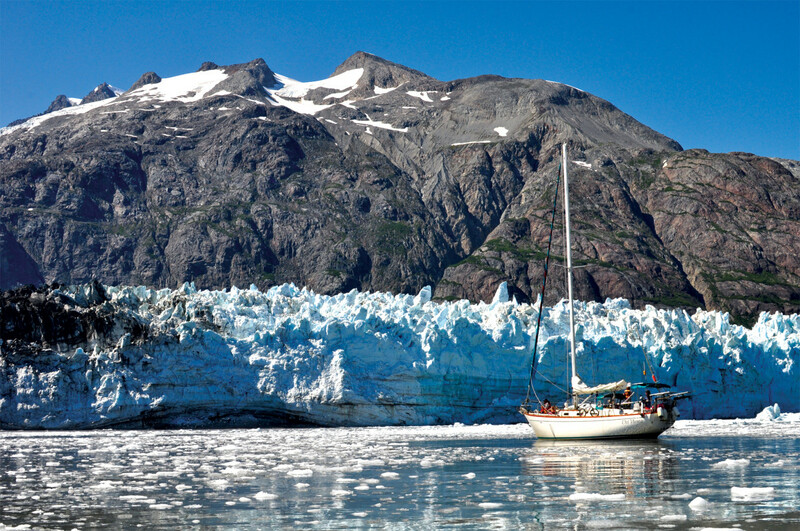 I first acquired my sense of Alaska’s Glacier Bay during my childhood. I don’t think we were halfway through the second season of ABC’s hit The Love Boat before Captain Stubing pointed the ship’s bow north. Bartender Isaac began mixing hot buttered rums, and Charo donned a coat on the Lido deck to watch the glaciers calve. Cuchi-cuchi! In the 30 years that followed, my grandparents and millions of others boarded big white ships to take their own Alaskan cruise. Just as a huge influx of tourists once spoiled the Yosemite National Park experience—so many cars that Ansel Adams’s vistas were veiled behind a smog that choked the valley—I was certain they’d paved paradise and that Glacier Bay was a cruise ship parking lot. 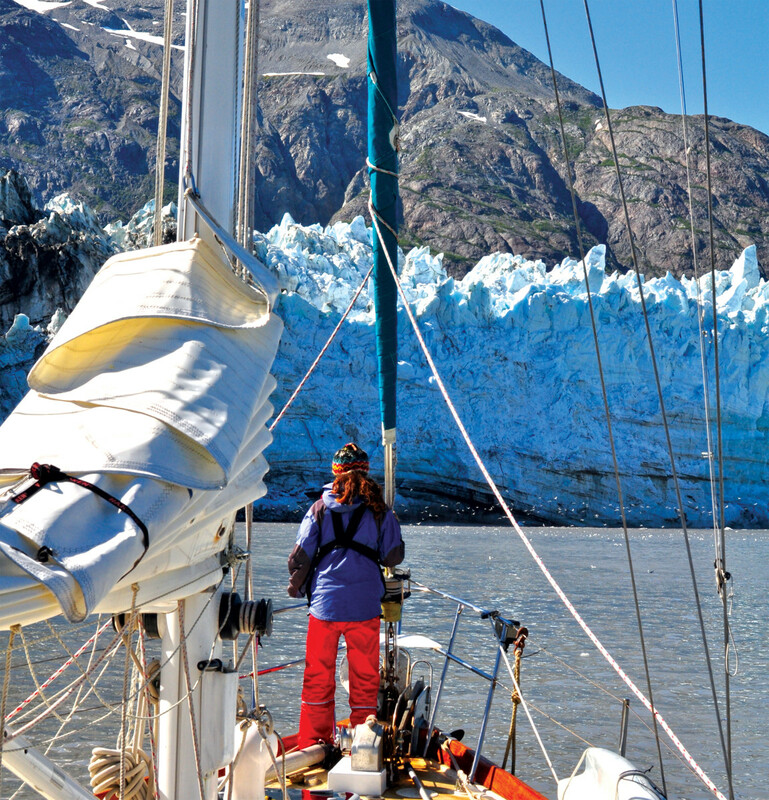 After a 45-day trip north from Victoria, British Columbia, we arrived at Auke Bay, Alaska, our staging ground for exploring Glacier Bay, 60 miles to the west. 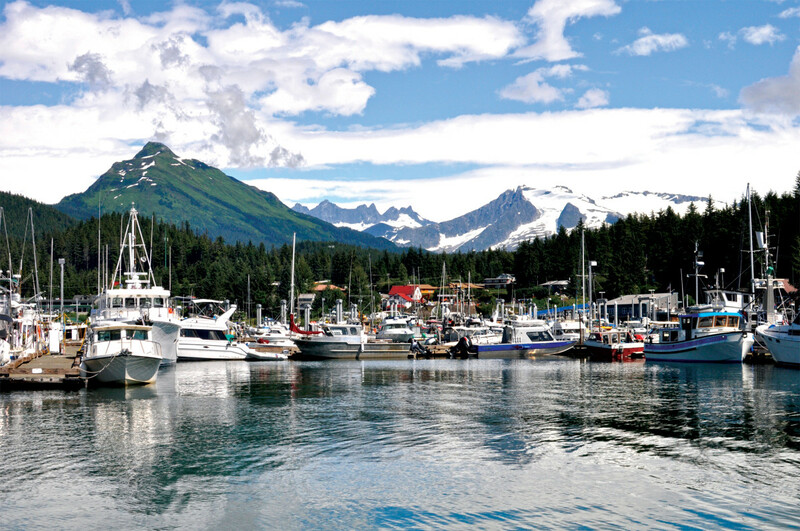 Auke Bay is a bedroom community of Alaska’s capital, Juneau, and features a very large marina with a fuel dock and easy bus transportation to a Safeway and a Walmart. About half the dock space in the marina is allocated to transients on a first-come, first-served basis, resulting in a summertime jumble. We idled around for an hour before a spot opened up, and we squeezed our 1978 Fuji 40, Del Viento, between a rusting 31ft crabber and Athena, a 295ft, three-masted, gaff-rigged work of art. Two days before the start of the seven-day reservation we’d made two months before, we motored out of Auke Bay, full up with fuel, food and water. After an overnight in Hoonah, we entered Glacier Bay from Icy Strait, through a five-mile-wide mouth, and headed up the Sitakaday Narrows. I don’t know what I expected, certainly not angels to fall from the heavens, certainly not an arch across the bay entrance with big letters spelling “Welcome,” but I wanted some indication we’d arrived someplace special—even a change in landscape would have sufficed. Instead, we were surrounded by low, unremarkable hills blanketed in conifers. No dramatic vistas, no icebergs and no glaciers—the only white I could see was snow visible atop distant mountain peaks. I think I erroneously imagined Glacier Bay resembling Superman’s ice-filled Fortress of Solitude, but on a much bigger scale. I didn’t know it then, but 220 years earlier, when Captain Vancouver came by here aboard the Discovery, searching for the rumored Northwest Passage, the mouth of this bay was little more than an indentation in the face of a single, massive ice field that covered and smoothed out all these tree-covered hills. Then, 85 years later, in 1879, naturalist John Muir, interested in learning more about how glaciers had carved out his beloved Yosemite Valley, traveled here with Vancouver’s 1797 maps in hand to find that a single massive glacier had retreated 40 miles, exposing the wonders of the myriad inlets, which we hoped to explore as well. We, however, were not yet privy to these many small anchorages. Instead, we hung a quick right and pulled into Bartlett Cove, as far into the park as we were allowed to go before checking in and attending the mandatory orientation. “You cannot travel up these inlets—they’re clearly marked on the map I gave you—not for another month, not until the harbor seal pups are weaned and ready to leave the safety of the bergs.” I nodded at the ranger, as did the seven members of a megayacht crew here for the same reason. “Also, you’re welcome to go up Tidal Inlet, here” he said pointing to projected map. “But we’re warning visitors that they do so at their own risk. Five to 10 million cubic meters of rock and dirt are poised to slide off this steep mountainside at any time.” I didn’t have to be a geologist to see the potential for a catastrophic landslide, obvious in the aerial photos he showed us. We watched a 20-minute video about other wildlife and about the Tlingit people, whose ancestral homelands are in Glacier Bay, and the cultural and spiritual significance of these homelands to nearby communities. After that, we spent the rest of the day wandering about the Glacier Bay Lodge, into the museum and through the gift shop, where we perched on cozy couches before a massive stone fireplace and used the free Wi-Fi. We also walked the trails around a nearby lake. As a more realistic picture of what lay ahead began to emerge, I became more eager to explore. I didn’t have long to wait. 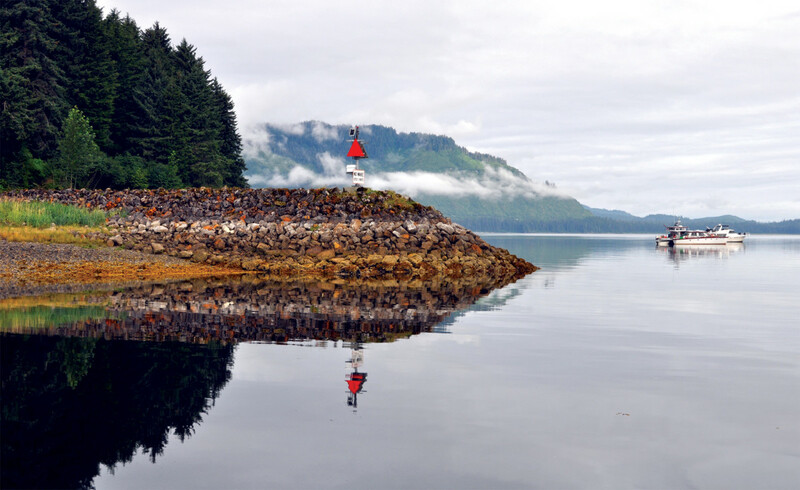 On our trip north via the Inside Passage, we’d gotten used to the quiet of well-protected anchorages. But our first night out of Bartlett Cove, after dropping our anchor into deep, dark water in the wilds of Glacier Bay’s Beardslee Islands, we were treated to an almost impossible stillness, with Del Viento frozen on a giant mirror, the low, late afternoon sun casting a warm light. We’d seen humpbacks earlier in the day, feeding at the surface in big, open-mouthed lunges. We’d seen bald eagles overhead and harbor seals clustered on small islands. But now, sitting at anchor, whispering to each other across the cockpit in this vast, quiet space, not another boat in sight, we seemed to be the only animals on Earth. From our first night’s anchorage, we mapped out a plan for the six remaining days, penciling a route that would let us, at 5 knots, see many of the inlets we were permitted to enter. Glacier Bay National Park is big, roughly the size of Connecticut and featuring 50 named glaciers that cover a quarter of that area. More than 450 square miles of navigable waters extend 65 miles up either one of two main trunks that fork at Tlingit Point, 25 miles from the mouth of the bay. Branching off either of these trunks are dozens of deep, miles-long ice-cut fjords. At the end of most of these is either a tidewater glacier, seen as a wall of ice rising from the water, or a rock and sand shoreline in front of a glacier ending on dry land. All but two of the park’s glaciers are retreating and have been for the past 250 years, at a rate that is one of the most rapid on record. 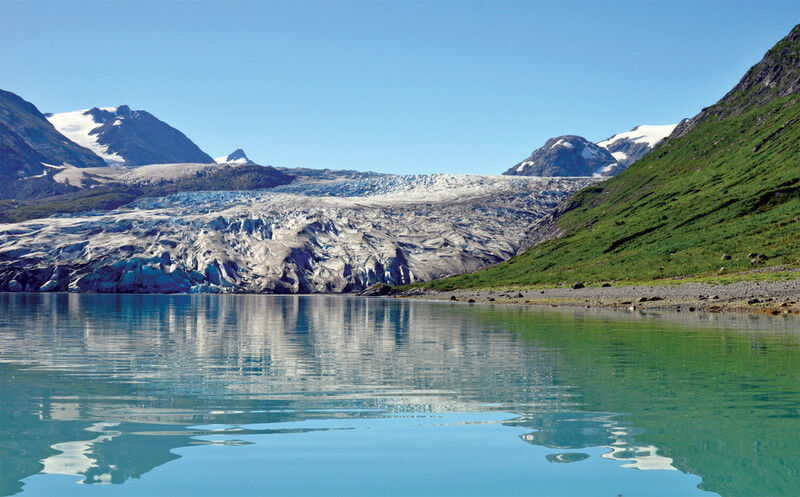 From the time that Muir traveled here extensively, letting the world know about this place through dispatches he sent to the San Francisco Bulletin, Glacier Bay has been a natural laboratory for scientists studying past glaciology. It’s here that they are able to observe the types and patterns of plants and animals that colonize an area exposed by a retreating glacier. 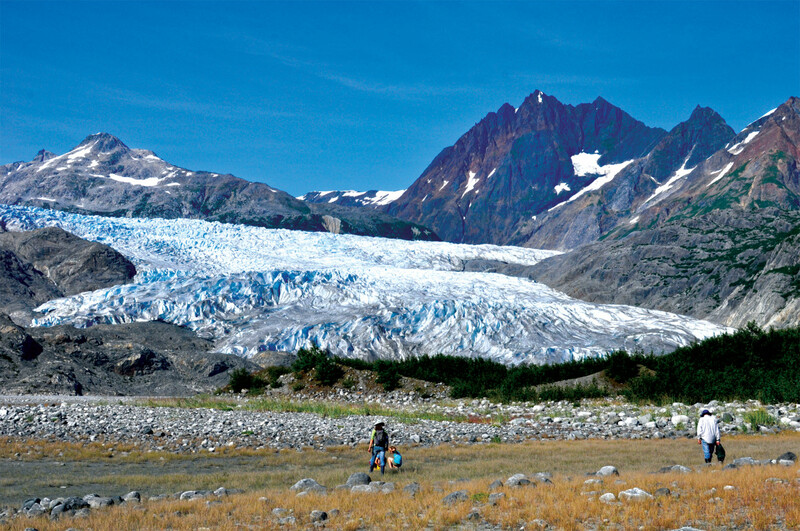 The glacier that Muir discovered, for example, the one at the end of Muir Inlet, was in his lifetime a massive, extremely active tidewater glacier, with a face that was 2 miles wide and 200ft high and had large bergs calving from it. Today it is thinner and miles up the slopes on which it was born. 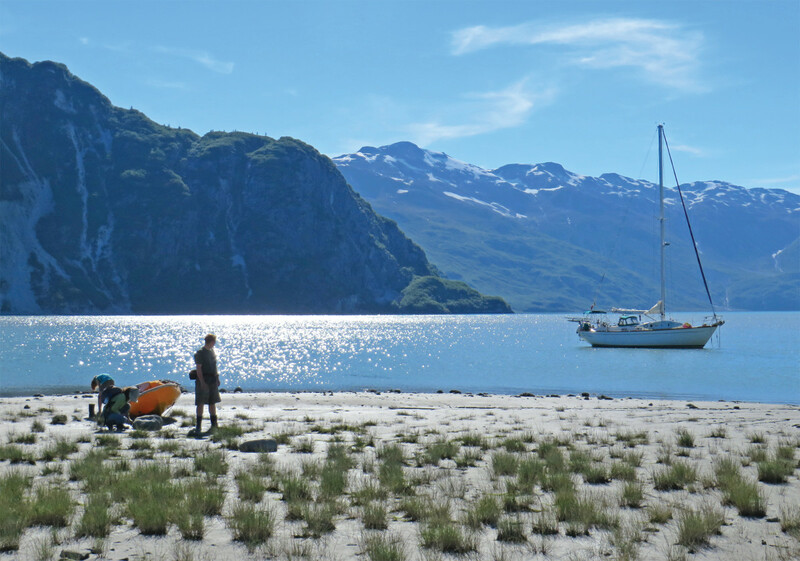 Our second day, we motored slowly up Tidal Inlet, the one we’d been warned about. None of us could shake our unease as we stared straight up a towering hillside that did indeed appear poised to slide down upon us. Still, Tidal Inlet is also the place where we’d heard bears were easy to spot, so I figured it was worth the risk. Sure enough, a short while later my 7-year-old daughter spotted two juvenile grizzly bears on the rocky shoreline. They ambled carelessly and slowly along the shoreline, foraging, the sun highlighting the bronze-colored hairs of their summer coats, rippling over fat and muscle. We glided up to within a boatlength of them, still in 40ft of water, and because we were downwind in a very slight breeze and moving quietly, they took no notice of us. Instead, they remained about 15ft from one another, each sniffing the ground and flipping 100lb rocks out of the wet sand with casual flicks of their paws. 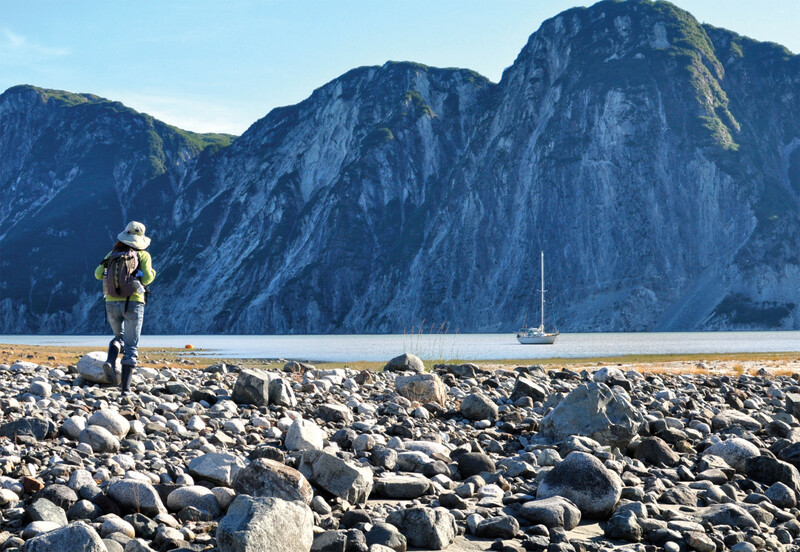 Johns Hopkins Inlet is a stunning, nine-mile path bound by steep, ice-carved walls that reach thousands of feet skyward on either side. At the mouth of this fjord, the Lamplugh tidewater glacier births iceberg after iceberg into the cold water. The Topeka, Hoonah and Gillman glaciers were also all visible, one by one, as we headed in. But the crown jewel lies at the very end: the jagged face of the largest tidewater glacier in the park, John Hopkins itself, reaching more than a mile across and rising 250ft from the water. As we approached, we slowed to pick our way through calved ice that ranged in size from houses to minivans to washing machines to microwaves to footballs, careful not to bump any of them with our fiberglass hull. We got to within about 2,000ft of the glacier wall before all paths were ice-choked. Even at that distance, the sharp reports of cracking ice sounded like gunshots. It was here that I discovered a strange thing about Glacier Bay: it’s impossible to estimate things like size and distance since everything is bigger than when it first appears. The air is so clear that faraway mountains appear nearby, and there are few familiar, relative reference points for judging size. At one point I spotted a cloud of gnats or fleas at the glacier’s base. When I realized, after looking through the binoculars, that they were actually gulls, the realization made the world around me pop, exposing everything in magnificent scale. Five miles behind us, where the inlet makes a 90-degree turn to start the final straight path to the glacier, a 3,000-passenger cruise ship appeared. I needn’t have wondered how close they would come and whether we’d be in their way. The ship stopped where we first saw them, paused for five minutes to give its passengers a glimpse of Del Viento and the glacier, did an 180-degree pirouette, paused another five minutes to oblige the passengers on the starboard rail, and then steamed away. We, on the other hand, stayed where we were for more than an hour just staring at the glacier, mesmerized, waiting for another mammoth chunk of ice to calve and explode on the water’s surface 100 or 200ft below. In fact, we spent much of our time this way, watching and waiting in awed silence before one of the active tidewater glaciers, smiles on our faces. The deeper we went into the park, the more we also found ourselves encircled by the Fairweather Range, which rises to over 15,000ft, making it the highest coastal mountain range in the world. These mountains seemed to define our space, orient us and magnify our experience, especially when we were off the boat, hiking over sharp, hard rock scree that we knew had been crushed and ground by a nearby 300ft tall wall of ice. We’d hike toward the faces of these massive terrestrial glaciers, each one reflecting a myriad of contrasting colors, textures and shapes cast in Grand Canyon-like proportions. Sometimes we’d drink from the meltwater streams that flowed from their bases. Once we rested our bare hands on the cold, hard surface, listening for sounds from within. Underway, we also paid close attention to the diurnal tides, sometimes ranging more than 20ft between high and low, invoking strong tidal currents that could either propel us or thwart all forward progress. Beyond that, though, the summertime days were long, and the rouge and purple sunsets wouldn’t happen until ten o’clock at night, at which point they’d linger for an hour or more, stretched out across half the sky. All in all, we enjoyed a weeklong feast, never knowing where to turn, usually needing a camera for each hand. Contrary to what I imagined and feared before we came, we saw so few boats during our high-season visit that most of the time it seemed we had the place to ourselves. We never saw any trash or evidence of human intrusion. We saw only three cruise ships, each briefly, in passing. They’ve definitely not paved, muted or tamed this bit of paradise.